Enterprise-grade audio conferencing solutions - Exponential-e Ltd.
Exponential-e’s Smart Audio-Conferencing service enables users to initiate and moderate their own audio conferences, enabling efficient and effective group communication and has advanced, flexible features that can be accessed by any phone, anywhere. thereby speeding up information sharing and decision making. Boosts productivity - by allowing ad-hoc meetings to be arranged as and when required. 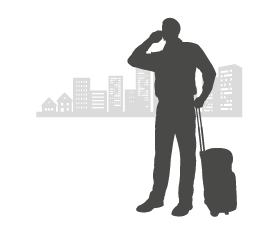 Reduces travel costs - by enabling participants to join conferences from any telephone - in the office, on the road or working from home. Removes barriers to discussion - as there’s no need to book a room to hold a meeting. Minimises conference set up effort - by auto-populating Outlook meeting invites with conference access numbers. Reduces conference management effort with the intuitive moderator client. Ensures security through personalised credentials and a conference-lock feature to prevent unwanted additional participants from joining a conference. Fully hosted solution - no hardware to install or maintain. 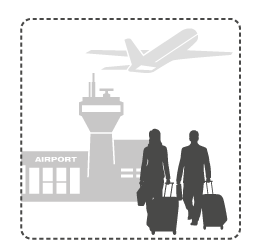 International Access - bring people together from abroad with UK and European conference access numbers. Geographic conference access numbers - low cost conferencing by avoiding expensive non-geographic conference access numbers. Outlook Add-in - makes it easy to set up and join conferences. Conference Moderator client - makes it easy to manage a conference so you get the most out of it. Powerful Touch Tone controls - available from any phone for moderators and participants once the conference has started. Why Audio Conferencing from Exponential-e? Easy and cost effective access using a UK or European geographic conference access number. 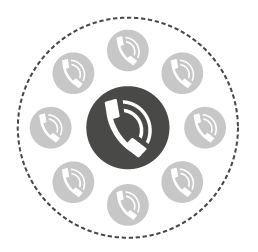 Included as standard within Exponential-e’s UC-One seat that also provides Unified Communications functions such as mobility, instant messaging, presence and video calling. Hosted PBX users benefit from the Outlook Add-in and Conference Moderator Client to monitor and control the conference. 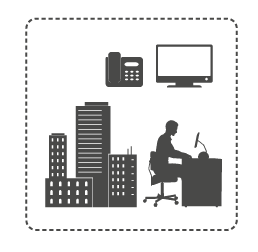 Easily added to selected users of Hosted PBX customers or SIP Trunking service or can be a standalone service. Conference Tab - Contains information and controls for the active conference. 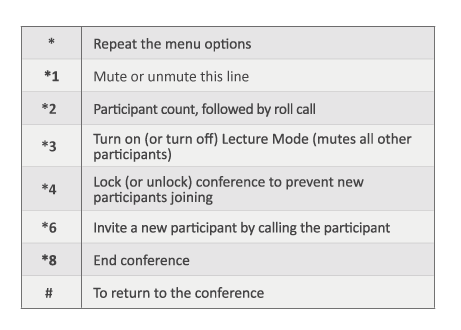 Dialler - Allows you to add participants to the conference. Conference Header Bar - Displays the conference name and number and contains general controls. General Controls - Allows you to perform actions on the conference. They are Lock/Unlock Conference, and End Conference. Moderator and Participant Lists - List conference moderators and participants, with their phone number and status, which can be Talking, Muted, or On Hold. Action Buttons - Allow you to perform actions on a selected moderator or participant. The buttons are Mute/Unmute, Hold/Unhold, and Drop. In addition, on moderators’ rows only, there is Lecture Mode On/Off. Global Message Area - Displays information, warning, or error messages. The Audio Conferencing Add-in for Outlook makes it easy to arrange and join conferences. When scheduling an Outlook meeting the Conferencing automatically populates the meeting invite. Phone number of the bridge and conference ID. Call Me Now link, that takes users to a web page where they can enter the number on which they want to be called back. 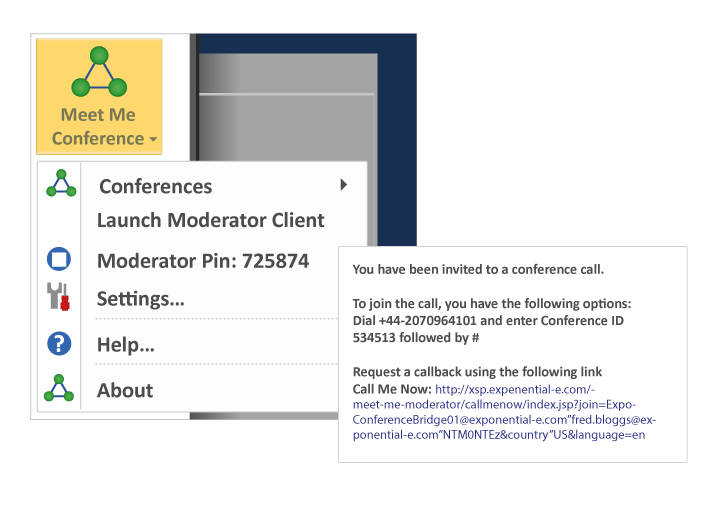 The Location text box of the invitation is populated with the bridge phone number and conference ID. Conference controls are available to both moderators and participants using touch-tones available from the telephone keypad. 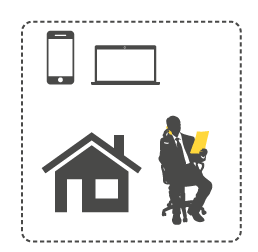 Watch our video to discover more about our Unified Communications portfolio and how we can help you to connect your workforce - wherever they might be, and whatever device they may be using.